The Spad A.1 made its maiden flight on 21st May 19155. Its performance was notably better than contemporary pusher designs and the French Air Force duly placed an order for the aircraft. Serial-production Spad S.A1s featured additional, mesh-covered intakes, six being mounted on either side of the gunner/observer’s nacelle, in order to provide cooling air for the engine. A new tubular mounting for a flexible machine gun was devised. The upper support struts were detachable allowing the nacelle to be lowered for engine maintenance. The observer was protected from the propeller – spinning right behind his back – by a wire mesh guard. A transparent panel in the floor of the observer’s nacelle was provided. The tailfin was enlarged and tapered. A total of 11 Spad A.1s were manufactured for the Aviation Militaire6. Serial-production Spad S.A2s featured a reduced wingspan and wing area, as well as a redesigned engine cooling system with additional air intakes on either side of the fuselage. A shield to deflect exhaust fumes was also installed. Of the 99 aircraft produced, 42 were delivered to the French Air Force, while 57 were exported to Russia. The Spad S.A4 was a development version, basically the S.A2 airframe coupled to a Le Rhône 9J rotary engine rated at 81 kW (110 hp)7. Ten aircraft were sold to Russia. The Spad S.A4 first flew in February 1916. The Spad S.A3 was a dual-controlled version with a gun fitted to both cockpits. Interestingly, the two crewmembers could switch roles and hence increase the field of fire. Only one prototype of the S.A3 version, designated S.40, was built. The Spad S.A5 was an S.A4 airframe powered by a 75 kW (100 hp) air-cooled, V-shaped Renault 8 engine. “In this machine the passenger is slung in a small fuselage in front of a tractor propeller. This arrangement is considered to be unnecessarily dangerous and the objects attained as regards arc of fire do not justify it. All the Spad machines are of similar type and are considered to be of no interest in their present form”. The Spad A2s and A4s were popular in Russia though, where they remained in active service until 1921. One Russian crew – Ju.A. Bratolubov and A.A. Kazakov – even scored an aerial victory in one of them. In early 1916 the Spad S.A2 was used as the basis of an experimental single-seater design armed with one, or alternatively four, fixed machine guns mounted in a cupola. In April 1916 an official British aircraft review mentioned a single-seat Spad armed with a single Hotchkiss mitrailleuse d’Infanterie machine gun with a belt of 1000 rounds mounted in a gondola in front of the propeller. This was the Spad S.G2, a prototype fighter. It was lighter, had a smaller wingspan, and a wing area of about 18.4 square meters. At 2000 meters it reached the speed of 161 kph and climbed to that altitude in seven minutes and 15 seconds. However, early 1916 saw the rise of the German Fokker Eindekker armed with a synchronized machine gun, while the very manoeuvrable and fast Nieuport 11C1 “Bébé” reigned in the French Air Force. Compared with these, the Spad S.G2 seemed a dead end in the evolution of combat aircraft designs. 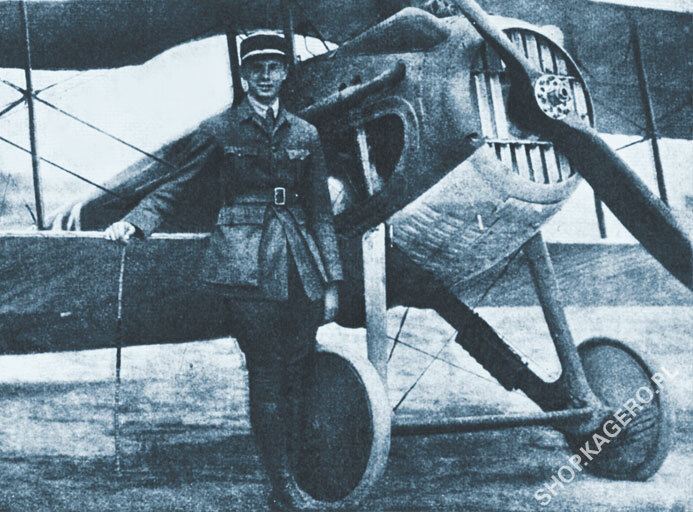 Louis Béchereau strove to construct a similar aircraft, a single-seat fighter armed with a single machine gun firing through the propeller arc. Power was to be provided by a 96 kW (130 hp) rotary engine. Three variants8 , the SL and SK biplanes and the SJ monoplane, were envisaged and respective prototypes were built, but none was actually flown. They all used a revolutionary method of constructing fuselages, first used in the Deperdussin Monocoque, a record-breaking racing aircraft – the light and strong ‘monocoque’ fuselage. Still, it took more than a well-constructed airframe to make a successful aircraft design. What Louis Béchereau needed was a new powerplant for his aircraft. Swiss engineer Marc Birkigt, who in 1904 was contracted by a Spanish automotive and engineering company Hispano-Suiza9, is credited with designing the first ‘cast block’ engine. Instead of machining separate steel cylinders, Birkigt’s design used cast aluminum blocks, into which thin steel liners were fitted. This made the engine more rugged and, at the same time, lighter. Birkigt’s engine had eight cylinders in two banks of four, arranged at a 90° angle in a V-type configuration. In 1914 he began to modify the engine for aircraft use. The new aero engine underwent trials in February 1915. It weighed 150 kg and delivered 103 kW (140 hp) at 1,400 rpm. Birkigt also designed a synchronizer gear driven by the engine camshaft. In May 1915 the French Military Mission got interested in the new product of the Spanish company. Two sample engines were brought from Barcelona to France, and in July 1915 they were tested at Chalais-Meudon. As a result of the tests, an order for 50 engines was placed in Spain and an offer was made to begin their production at the Hispano-Suiza factory in Bois-Colombes. The new engines also caught the attention of the British, who ordered them in August 1915. In autumn 1915 Louis Béchereau, with only a mock-up of the Hispano-Suiza V8 engine at hand, began to design his new fighter around it. It was to be a tractor biplane with its wing bay construction taken from the Spad S.A2 and a wingspan of 7.62 m. Initially it received the company designation Biplan-SH110 . The wings had neither dihedral, sweep nor stagger. The ailerons were attached to the upper wing and were operated by the same system that had functioned successfully on the Spad S.A2. The lower wing had a slightly reduced span. In order to improve visibility from the cockpit, the customary cutout was provided in the mid-section of the upper wing, and parts of the lower wing at the trailing edge adjacent to the fuselage were also cut out in similar fashion. The front section of the carefully streamlined fuselage housed the engine, mounted behind an octagonal radiator. The engine cylinder banks protruded out of the otherwise smooth outline of the fuselage, and were covered with teardrop-shaped fairings. The Biplan-SH1 featured a large conical spinner with a central opening to allow cooling air into the engine, and the radiator and its cowling were circular to blend with it. The control surfaces and the landing gear were also modelled after the Spad S.A2. In April 1916, when a Hispano-Suiza 8Aa engine rated at 111 kW (150 hp) was obtained, a prototype Spa. V was built and first flown11. It was armed with a single synchronized Vickers machine gun. The propeller spinner was discarded. Exhaust fumes were ejected from the engine cylinders via short exhaust stubs. During factory tests the Spa. V attained a top speed of 200 kph. Official trials, carried out in April and May at Villacoublay, proved the overall sturdiness of the construction, which allowed diving speeds of up to 300 kph to be reached. Although the level flight speed and climb rate were inferior to those of the Nieuport XVIIC1 or the German Halberstadt D.II, 268 aircraft were ordered to be built. The SFA12 designated them Spa. 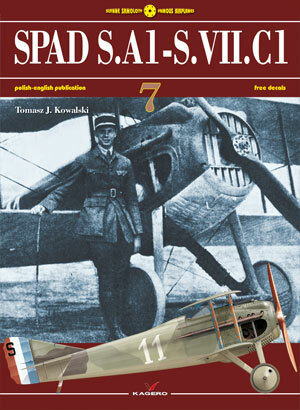 VIIC1 (Spad S.VII.C113 ). In case deliveries of Hispano-Suiza engines failed an alternative powerplant was sought, and to this end one Spad was experimentally fitted with a Renault engine rated at 109 kW (150 hp). The engine was also a V-8, but had its cylinder banks angled at 60° (as opposed to 90° on the Hispano-Suiza). Its installation required considerable modification to the aircraft’s nose and cowling. Serial-production machines were slightly different from the prototype Spad V14 . Long exhaust pipes ran along either side of the fuselage and terminated just to the rear of the pilot’s cockpit. By the end of September 1916 the SPAD company had delivered only 24 aircraft (instead of the expected 50) to the French Air Force. This delay was caused by the relatively small production capacity of the plant, as well as an inadequate supply of raw materials, an issue not taken into consideration when the order was placed. In August 1916, the first three Spad S.VII.C1s were allotted to: Lt. Armand Pinsard of Escadrille N26 (s/n S.122), Sgt. Paul Sauvage (s/n S.112) and Lt. Georges Guynemer (s/n S.113), the latter two of Escadrille N315. Problems continued with the delivery of radiators, which proved a major ‘bottleneck’ during the production of Spads. Initially, the radiators weren’t even standardized. The plants producing them experienced shortages of raw materials (mainly copper and brass), which hindered production and caused maintenance problems with the aircraft already in service. In March 1917 the radiator was finally standardized: the octagonal Bonfils et Laval radiator was chosen, having been found most resistant to engine vibration.